When first lady Michelle Obama told more than 14,000 women last week that women?s ways of knowing just how, and when, to support each other is one of the characteristics that sets them apart from their male counterparts, the largely female audience responded with enthusiastic applause. ?It is what we do for our sisters and our girlfriends, for our mothers and our daughters,? Obama said. ?We show up. We show up at the door with some food. We show up at the door with some chocolate and, if things are really bad, we show up at the door with a bottle of wine.? During her 25-minute speech at the Women?s Conference in Long Beach, Obama spoke about the sacrifice and hardships of military spouses, mostly women and mothers. Frequent moves leave these women constantly struggling to find child care, pediatricians, schools and work. Her message about the need for communities to work together and help each other was universal. First 5 LA is taking a similar approach in the 14 Best Start communities, where the health, safety and success of young children will depend on the adults working together. Jill Biden, wife of Vice President Joe Biden, also spoke about military families and shared some of her experiences as a mother to a son, who deployed to Iraq as a captain in the Delaware National Guard. Like Obama, she said she has traveled the country talking to military families about issues including childhood obesity, health and education. Biden said she is most proud of the White House?s commitment to education, acknowledging the struggle it is for children and adults to get the schools they deserve. ?Education, for me, is not an abstract policy debate,? Biden said. ?It?s about real people who lead real lives.? The conference was organized and hosted by Maria Shriver, first lady of California. 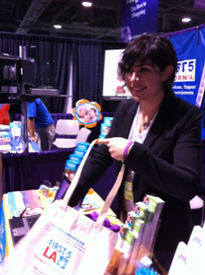 While attendees inside the Long Beach Convention Center browsed hundreds of exhibitors? booths -- including those of First 5 LA and First 5 California ? and listened to celebrities, dignitaries and health, fitness and finance experts, about 50 people gathered outside in a rally organized by nonprofit child development agency Crystal Stairs, to protest the decision by Gov. Arnold Schwarzenegger, Shriver?s husband, to cut child care funding.